Who doesn’t want to spend their holidays island hopping, cocktail or beer in hand, bikinis or board shorts on, swimming, relaxing, sailing, soaking up the sunshine and just radiating happiness? Sounds miserable? Then a bareboat sailing holiday in the Whitsundays is not for you! Would you like to choose your own adventure? Visit island resorts, explore national park islands of the Great Barrier Reef Marine Park, have a game of beach cricket, a beach party with friends under the stars, read a book in the sun, catch a fish, dive straight off the back of the boat and go for a swim to a deserted island… sounds pretty good? Read on! When you book a Whitsunday bareboat sailing holiday, you get to do all of the above, and more, while island hopping the beautiful Whitsunday islands entirely at your leisure. The majority of the Whitsunday Islands are National Park, and a day trip might take you to 2 or 3 of them. If you really want to go proper island hopping around the Whitsundays, the only way to do it is to book a week-long bareboat sailing holiday. Home to Whitehaven Beach and Hill Inlet. Need we say more? The most famous beach in the Whitsundays (some might argue it’s the most famous beach in Queensland or even Australia) is your oyster when you hire a bareboat. You can be the first or last person on the beach any day of the week, and you can have your own private beach party. Some of Australia’s best snorkelling and diving spots, our only visitable Aboriginal site, long fjord-like inlets lined with pine trees, good snorkelling sites, and some beautiful anchorages in all weather conditions. A beautiful sand cay, with a resident turtle population. At low tide you may be able to walk between the tip of the cay and the island at the far end, where you’ll find a new short 600m bushwalk. The southernmost reaches of the bareboating area, this rarely visited island has a real ‘castaway’ vibe and you might not see another boat for days. The Whitsundays’ biggest resort, Hamilton Island, welcomes bareboats, not only can you do important things like buy groceries and drinks, top up water tanks, and get rid of rubbish, you can also take advantage of the island’s facilities like the pools, resort activities, swim-up pool bar, and restaurants. Lots of secluded bays and some beautiful beaches and coral, Chalkies Beach is one of the only beaches that shares the same brilliant white silica sand as Whitehaven, and now has 5 new public moorings suitable for bareboats. The resort may be closed but the beach is lovely, the bay is well-protected and there are some excellent bushwalks of varying degrees all over the island. Other beaches on the island are worth exploring in light conditions too. 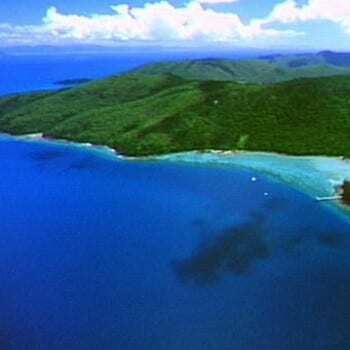 The furthest north of the bareboat charter area for Whitsunday Escape, other companies can’t take you here. It has a secluded western-facing beach at Bona Bay that only the locals seem to know about which is a great place to watch the sun set. Visit the small Cape Gloucester Beach Resort directly opposite on the mainland if you would like a meal and a drink. We honestly believe a bareboat sailing holiday is the best way to see the Whitsundays. It’s total freedom, at your own pace, on your own itinerary. We may sound biased, but we genuinely love what we do and we love to share it with you! Want to go island hopping by bareboat in the Whitsundays? Book a bareboat charter yacht to go island hopping with Whitsunday Escape and explore the Whitsunday islands.